Christmas... a beloved season for so many, including me. I love the way life stops and we have permission to just be... to be with our families, to be quiet, to be merry, to be like a child, to be a believer of miracles, to be in awe of the gift of our Savior once again. But sometimes Christmas is hard. And instead of being, we are bent. We can't find peace because we are in pieces. There is no wonder, but only wondering. I know because I've been there. I remember that Christmas like it was yesterday. I can feel the ache of disappointment, the weight of worry, and the despair of hopelessness. It was supposed to be a happy time. Not just because it was Christmas but because a baby had come into the world. My baby. My Emma. But her birth didn't bring the joy we had expected. Oh, we loved her. We were so overwhelmed by love for her but also fear and confusion and shock. There was no warning, no time to prepare for all that we would face. The days after her birth were filled with tests and procedures and an awful diagnosis and prognosis. Finally, after many weeks in a hospital, they sent us home with our baby. Just in time for the Christmas season. Our directions were to make her comfortable. The underlying message was that she wouldn't be with us for long. But we were so happy to just be home. For Christmas. It was so hard that year. Days were filled with appointments and nurses and setbacks and ER visits. It was overwhelming and I remember just sitting in the dark living room holding my little 5 pound girl with the oxygen tube and the feeding tube, feeling lost and forsaken. But just holding her while listening to Christmas music as the tears rolled down my cheeks and onto hers and I would just be. Be scared, be thankful, be angry, be so tired. And then came Christmas Sunday. It was going to be an exciting day. It was Emma's first time in Church and my first Sunday back since her birth. We were having her dedicated. But it was such a terrible morning. She was so sick. She was throwing up blood and I was losing it. I just couldn't take care of such a sick child. God had chosen the wrong mother. I just knew it. I wasn't strong enough to do this. We somehow managed to get to church that morning. I was pretty angry with God. Instead of placing my baby in His arms I wanted to walk away that day. How could He have done this to her? To me? Where was He? Did He know how scared I was? 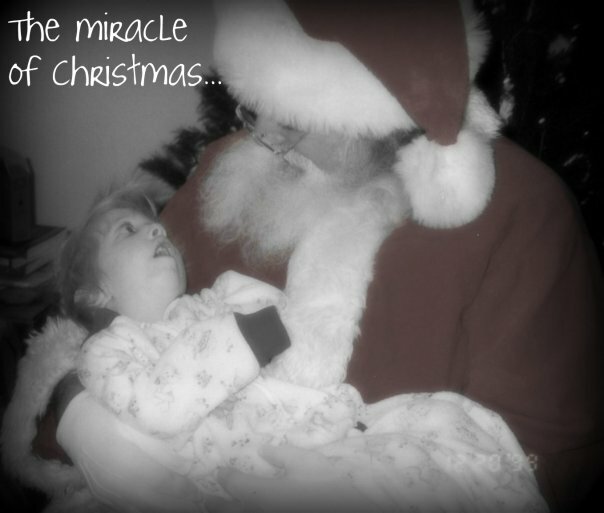 How much we needed a miracle? I was just trying to get through that service and that song. But as I sang this song, Mary's Song, I realized for the first time what it must have been like for Mary. Did she wonder, as I did, if God had chosen the right one? Was she so scared she couldn't breathe? Did she feel as if she could just fall apart at the seams? Did she feel alone and abandoned? I don't know but those words became my words. As I sang them I could feel my heart pleading with God... Breath of Heaven, hold me together. Lighten my darkness. Help me be strong. Help me be. And in that moment I felt some healing. I could feel Him breathing life back into my wounded spirit. I knew I wasn't alone. I knew He had a plan for this baby and that I was a part of it. And I was the right one. As we dedicated her to Him that morning I also dedicated myself to His plan. I offered all I had to be used to complete His work in this little girl's life. And beyond. He was my breath that morning and every morning since. Through the days of grief when I couldn't catch my breath, He was my breath. The breath of Heaven. There have been many Christmases since that one. Many are still hard. But I can know for sure that I am not alone. That the miracle of Christmas is that the Savior of the world came down to be born in a lowly stable and He also chooses to breathe Himself into me. Not because I am worthy but because I am loved. So even when Christmas is hard it can still be wonderful. What a heartfelt story. Thank you for sharing it. I too know what it is like to be confused and scared in the delivery room and your words and the words of the hymn speak to where I am right now during a very difficult time in our family's life. May God bless you and may you feel his breath on you this Christmas.